Wifi security cameras give you great home protection 24/7. Ooma Smart Cam is a wifi security camera that operates and updates automatically using your home wifi connection. This next generation indoor/outdoor camera delivers many advanced features including onboard memory and battery backup, night vision, and 7 days of free cloud storage. 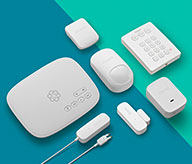 Wifi cameras that connect and protect. Ooma Smart Cam is compact and elegantly designed, so it can be placed anywhere. The camera will then connect to your home’s wifi, meaning there’s no need for wires or a base station. From there, you can use our mobile app (iOS and Android compatible) to configure and control your settings, or view live and saved timeline video events. Instant video capture: Whenever motion or a loud noise is detected, the camera immediately uses your wifi to connect and start recording in less than a second. 7 days of free storage: With cloud service built in, the Ooma Smart Cam will record the last seven days of home activity at no extra charge. Secure transmission: Ooma Smart Cam uses SSL encryption whenever video is transmitted to the cloud, so your timeline video events are always secure. Auto privacy mode: The camera is equipped with geofencing settings, meaning it can be automatically turned off when the user leaves home, and turned on when the user departs. Benefits of wifi security cams. Cost-effectiveness: The entire set up with Ooma Smart Cam is DIY. Not only will you be up and running in minutes, but you won’t have to pay for an expensive, lengthy professional installation. Blends in easily: With a wifi connection, you have the ability to place the Ooma Smart Cam anywhere. You have several indoor and outdoor mounting options at no additional cost, giving you even more flexibility. 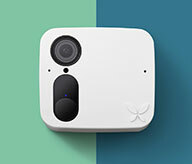 Cameras that move with you: If you want to monitor an entirely different area of your home, or if you move across town or relocate to an entirely different city, your camera can be reconfigured in the cloud and move with you. Videos are backed up in the cloud: Because all of your video data is stored in the cloud, your video content will always be backed up and easy to access. Wifi security cameras give you the accessibility and flexibility you need to protect your home 24/7 from anywhere. To get a more in-depth look at the many features of Ooma Smart Cam, watch the video below or visit our features page.